What's Using All My RAM? Arcticsid asked the Answer Line Forum how he could find out what's using up so much of his PC's physical memory. If you want more details, press CTRL-ALT-DELETE to bring up the Task Manager (in Vista, you'll then have to then click Start Task Manager). Click the Performance tab to see how much physical memory you have free. 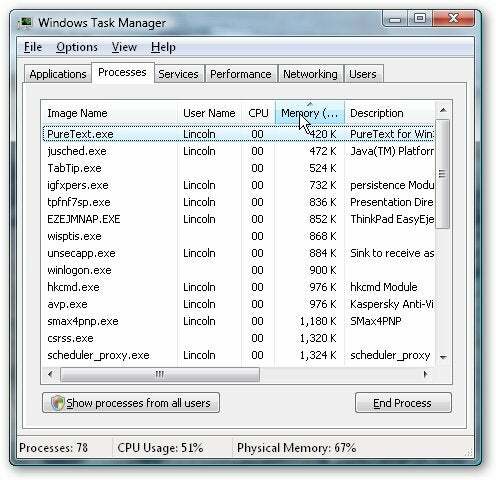 Processes tab for a list of all of your running processes, which are the bits of programs actually using memory. Click the Memory column header to sort them by size and easily identify the worst offenders. For more on processes, including help identifying them, see What Processes are Safe to Close? If you need more free memory, try closing a few programs. If this is an ongoing problem, consider buying more RAM. Also, remember that if your desktop PC is using onboard graphics, buying and installing a separate graphics card will free up some RAM. My thanks to Piyushsingh and Coastie65 for their contributions to the original forum question, which you'll find at http://forums.pcworld.com/message/128533.